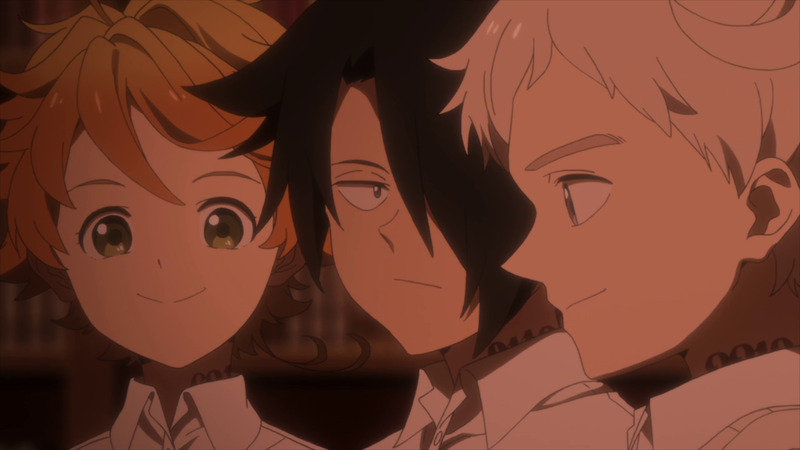 With the majority of The Promised Neverland taking place inside Grace Field House in tense conversations between the three main leads — and later the two additions of Don and Gilda — the series is pressed to find ways to make these visually interesting while adding extra tension. 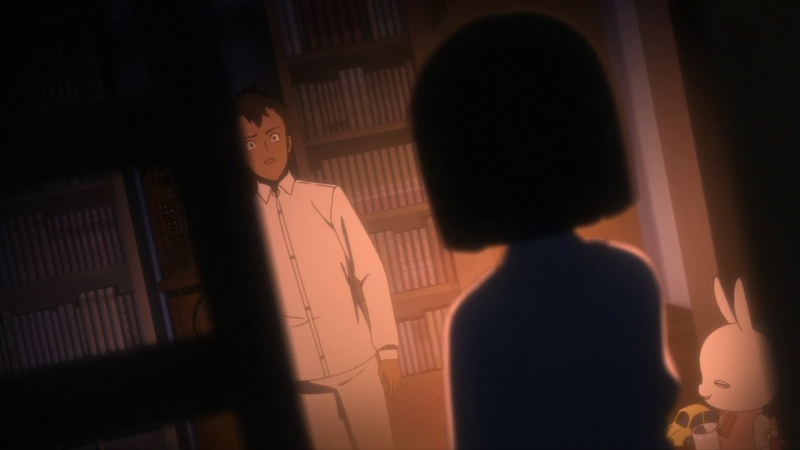 Frequently this is done through camera angles that either showcase a certain character’s unspoken perspective or reiterate the fact that these children (and Mom Isabella and Sister Krone) are always being watched. 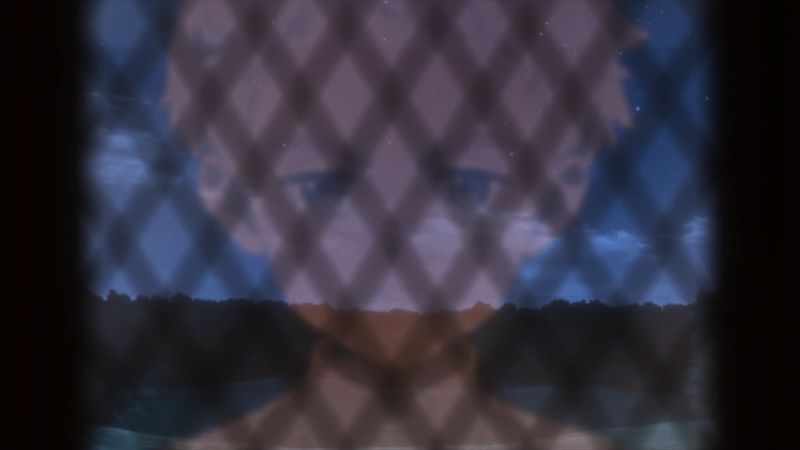 For example, in Episode 6, whenever a character looks out or is framed by one of the windows, the bars appear to box them in like the shot with Norman shown above. 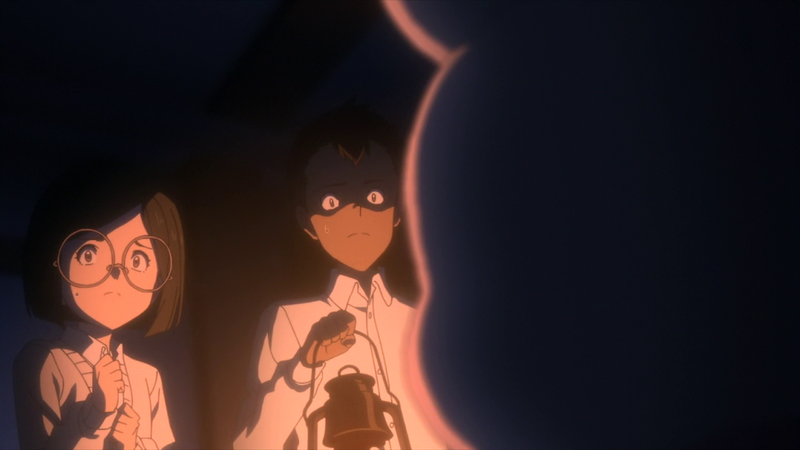 As they plot their escape, keeping us on edge as an audience through cinematography, sound design, or lighting is key to maintaining a stressful viewing experience that somewhat reflects the emotions felt by the children in the series. Lighting takes center stage in Episode 6 as Don and Gilda go off on their own adventure while Emma shows Norman and Ray something she found in the library. Up until this point, lighting had been important, but it also hadn’t taken over an episode either. Most tension or added context was through shots like the one above where furniture visually separates Don and Gilda from Phil, who has just run into Mom’s room while Don and Gilda are sneaking around. 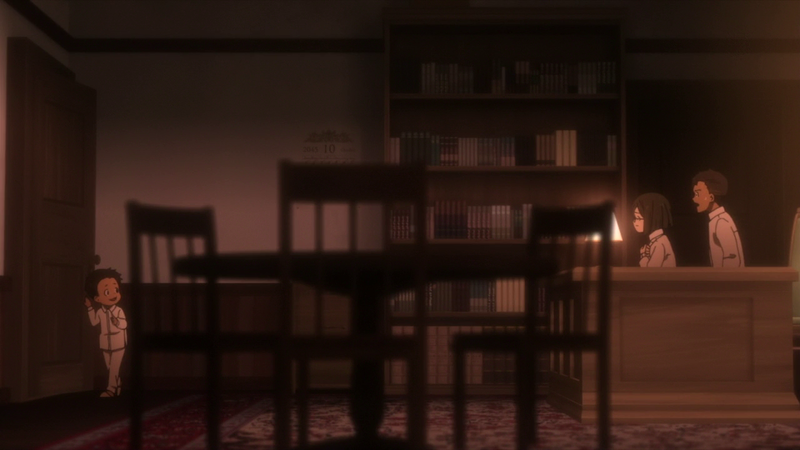 Presumably knowing nothing of what Don and Gilda are doing — although the visuals cast doubt over Phil, as does his later contribution to Emma’s revelation of William Minerva and his messages in the library books — Phil is separated by the table that is out of focus in the foreground. The light source, a lamp on Mom’s desk, is conspicuously placed next to Don and Gilda, although Phil is also pictured in its light. 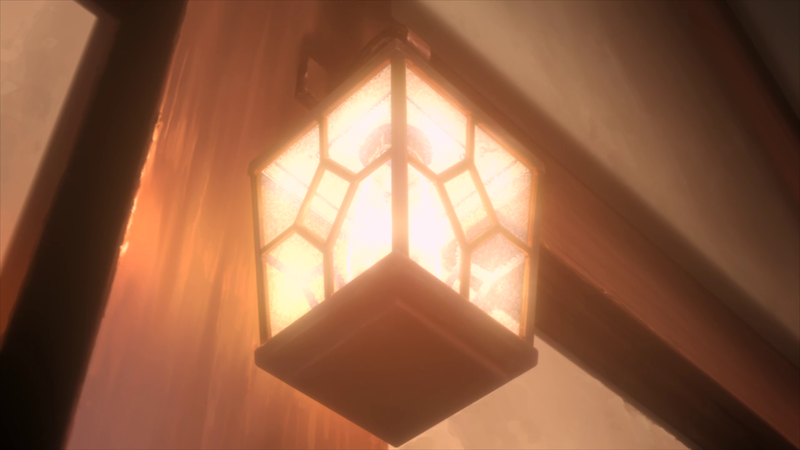 As Don and Gilda work their way into Mom’s secret room, their primary source of light is a lantern. 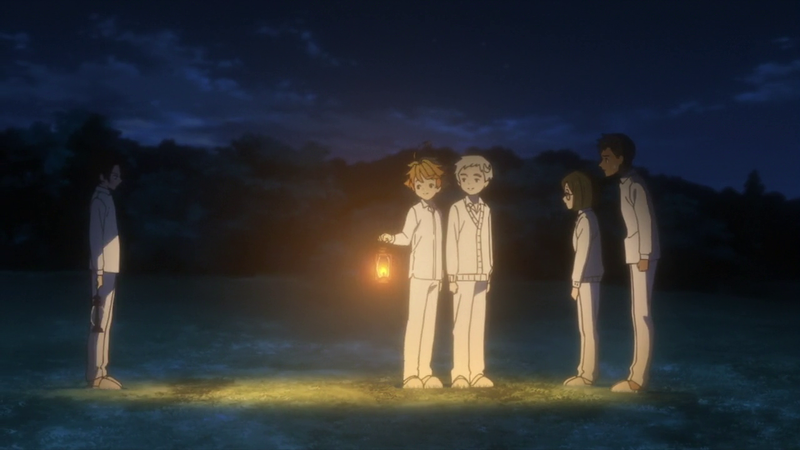 The lantern’s more directed light allows for The Promised Neverland to play with what that light illuminates and what it doesn’t based on Don and Gilda’s discoveries. Here, the faces of the two are lit as Conny’s Little Bunny looms in the foreground. There are a lot of parallels between Don and Emma — both are guided primarily by their emotions and love of their family members — and here, the lighting unites their initial reactions that lead to their eventual acceptance that Mom is not to be trusted. In their breathless run during the first episode, Emma is slow to accept that Mom is the enemy, practically begging Norman to tell her otherwise even though she already realizes, deep down, that this is the truth. Here, we see Gilda speaking her thoughts aloud, realizing that there’s no way that Little Bunny or any of their other former family members’ beloved trinkets would be here if they had truly been adopted as Mom said. Don’s reaction is to back out of the light, telling Gilda to stop it. He inadvertently stumbles into a bookshelf that reveals Mom’s hidden radio setup, and here is where the pieces fall into place for Don. Don comes back into the light as he talks about how not only is Mom hiding so much from them, but the fact that Norman, Emma, and Ray definitely haven’t told he or Gilda the entire truth. The transition from Don saying that he can’t trust the main trio anymore because they don’t believe in Gilda or himself is particularly interesting. Emma, Norman, and Ray’s scene in the library runs concurrently with Don and Gilda in Mom’s secret room. 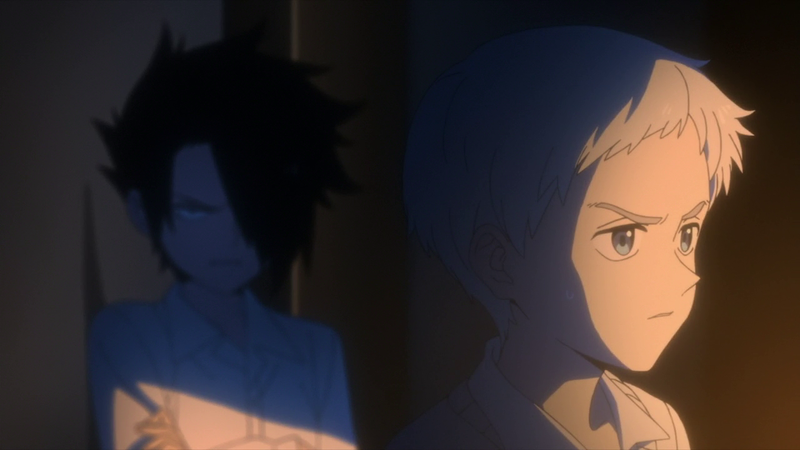 The Promised Neverland swaps between these two conversations, knitting them together and inviting comparison. 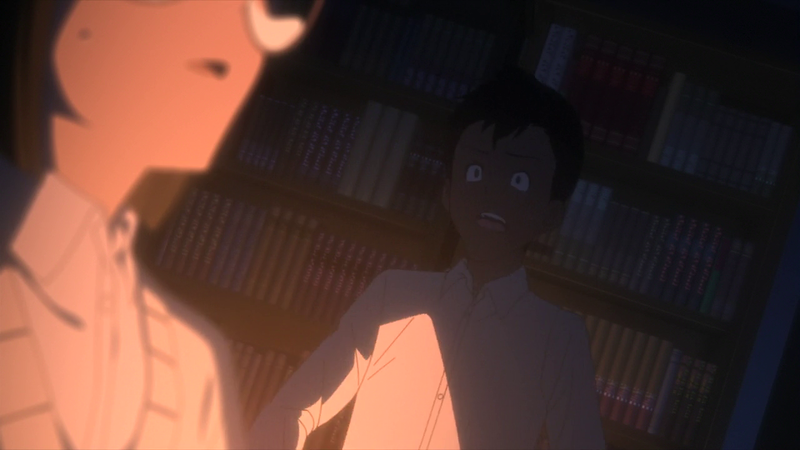 It also pointedly shows Norman, Emma, and Ray in the same level of lighting — which comes from a lantern that they lit themselves in the library — all on the same plane. They come into focus together. They’re united as three. 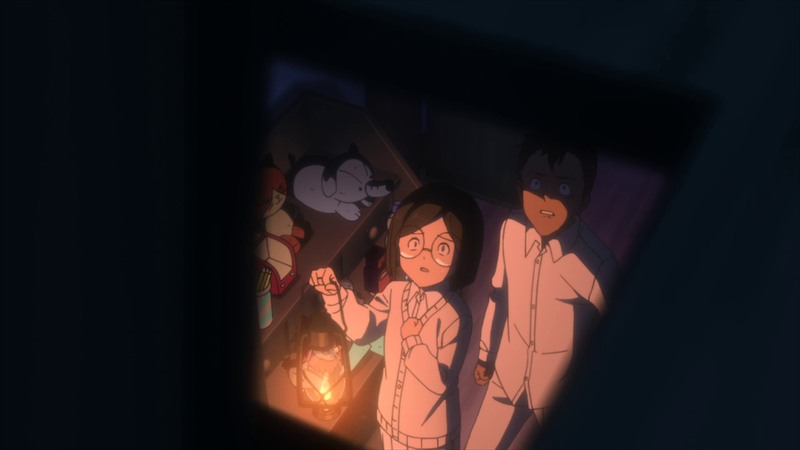 Meanwhile, throughout Don and Gilda’s simultaneous discovery in Mom’s room, the two are in stark lantern lighting that doesn’t show them and their surroundings equally. Don and Gilda aren’t considered equals to the main trio and the lighting reiterates this. Lighting also plays a large role in Don’s conflict with the main trio and eventual resolution. 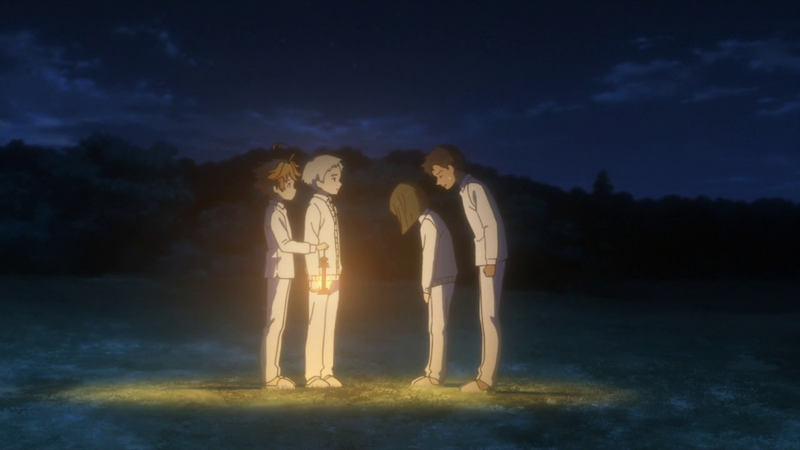 The Promised Neverland keeps the dramatic lantern lighting for their fistfight, and also uses it to isolate Ray from Norman — Ray never thought that Norman should have lied to Don and Gilda about Conny possibly being safe. 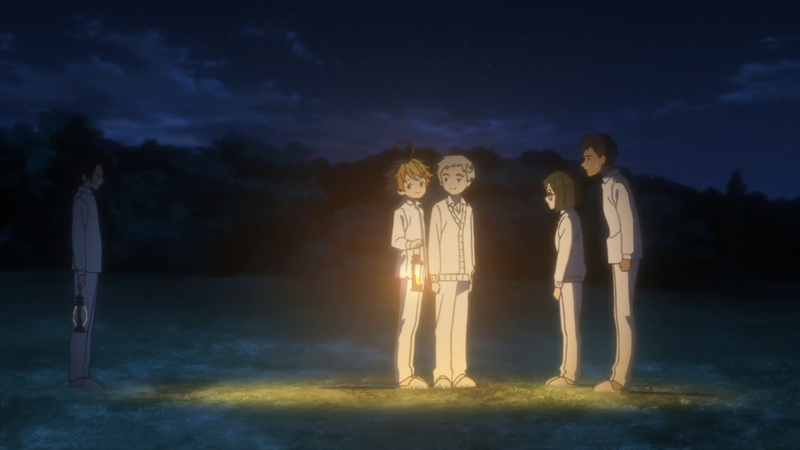 When Emma and Norman go to Don and Gilda to apologize, all four of them are shown in the lantern’s light, uniting them.